A simple recipe to get us through the middle of the week. 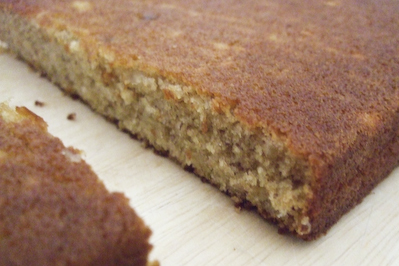 Hands up who likes banana cake?! Or banana bread? Let's face it, banana bread is banana cake. I remember my first semester of uni, where every early morning physics lectures was preceeded by a huge mocha and a piece of toasted banana bread slathered with butter. I can't believe what a fatty I was. These days I still indulge in banana bread every now and then (without the copious amounts of butter), and whenever I feel like banana cake at home I always turn to my trusty Stephanie Alexander recipe from The Cook's Companion. I've decided to add this recipe to the 'Foolproof' category, because it has never failed me no matter how many times I have done it, and no matter what kind of weird things I add to it. This time I happened to make it for Simon's birthday picnic, pairing it with this amazing passionfruit cream cheese icing which I've whipped up a couple times. 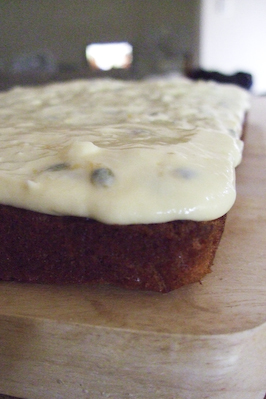 Banana cake with passionfruit is a winner of a combination that I first tried years ago thanks to a birthday cake we bought my Mum from Simmone Logue, it beats plain cream cheese icing any day. 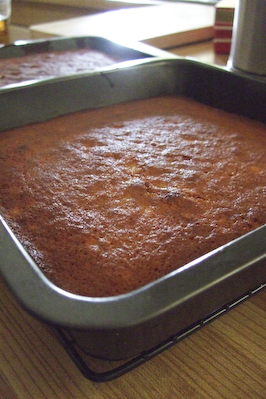 I decided to keep it simple for Simon's picnic, mostly because I was super lazy, so I split the batter into half and baked them as thin cake slices rather than a full sized cake and slathered the top with the icing. Unfortunately for my poor cake was not prepared for the intensely humid 40+ degree weather at centennial park that day, and it pretty much collapsed on itself. I think the moisture from the cream cheese seeped into the cake, turning it into mush. Taking it home and refrigerating it didn't help, the whole thing went a bit strange textured. So I guess this cake is foolproof until you decide to spend the afternoon in oven-like conditions! But don't let my bad luck deter you, this cake is normally super moist and packed full of banana flavoured goodness. Butter and flour a 20 cm square cake tin then line the base with baking paper (or two if you want to make thin cake slices rather than a full cake). Preheat oven to 180 degrees C. Cream butter and sugar until pale and fluffy. Bean in eggs, banana and vanilla. Sift dry ingredients and add to mixture, alternating with buttermilk. Spoon into tin and bake for 45 minutes or until cake tests clean. Cool cake in its tin on a wire rack for a few minutes before turning out. Place cream cheese in a large mixing bowl and beat with an electric mixer until smooth. Sift icing sugar into bowl. Add butter & lemon juice and then beat together until well combined. The mixture should be quite shiny. 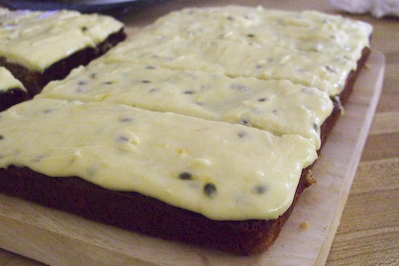 Add pulp from passionfruit to the icing and fold to combine. Spread liberally over the cooled banana cake. Can be stored in the refrigerator in an air tight container. That first picture is pure indulgence I nearly raised my hand when you asked who likes banana cake/ bread! I do! And I love your recipe. Thank you for sharing! This looks perfect to make for work morning tea - simple and impressive! Thanks for the recipe. yum - i love the idea of making this as a slab cake, significantly improving the icing to cake ratio :) shame the cake melted, but that day was so super hot i think the melting icing merely reflected everyone's posture that day. I thought the cake was real nice, albeit the icing was quite runny (understandably so). Haha - tell it like it is Steph. Banana bread is banana cake! Let's not kid ourselves at the cafe every morning when we think it's a true alternative to vegemite on toast. It's dessert for breakfast! I eat it. I can admit it - I don't mind cake for brekkie! The passionfruit cream icing though delicious looking might alert ppl to the fact that it IS cake though.. I wonder if any other cakes can be renamed breads in a guise to make them appear more breakfast-suitable or healthy-sounding...Chocolate mud bread, anyone?! I thought the cake was still awesome! Loved the passionfruit and banana combo. LOL yes banana bread is essentially banana cake to me, and breakfast muffins are still cake as well! Banana cake + passionfruit = winning combination for sure. I can't believe the crap I ate in first year uni either. Hungry between lectures? Let's get a massive bowl of wedges! Bit peckish in the afternoon? That gigantic muffin looks tempting! And let's not forget the regular sessions at the tav... yeesh. Love banana bread/banana cake! It's always a winner with me, no matter the time of day nor the place! Love the sound of the icing, too bad it collapsed onto itself, but that day was so hot, I don't think anything would have stood a chance! Yummm... passionfruit + icing = winner! And it worked so well with your banana cake! Melted or not, still tasted damn fine! Lorraine - Mmm same here, I used to make it with lemon but passionfruit is just as good! Simon - Yes it did get super runny unfortch :( Next time im making it in winter! Jacq - Aww thanks :) Haha muffins are the worst, people think theyre healthy! Conor - Hehehe exactly! Haha you're so right, those wedges were the perfect lecture snack. Ughhh where did my metabolism go? Joy - :) Hope it turns out well for you! Thanks! I don't have allspice can you use something else or leave it out all together? ?